Powers/Abilities: None. He possessed great leadership skills and was always a step ahead of his enemies. He was a visionary in warfare with all the highly sophisticated technologies he commanded like the Flying Führer, Murder Mountain, the Sky-Mines and the Tangler. Besides that he was trained in the use of conventional weapons. (Avengers 1959#4 (fb) - BTS) - Skul joined the Nazi party the same day the stock market crashed in New York City. (Marvel Fanfare I#16 (fb) - BTS) - In 1940 General Skul's men captured test pilot Matt Slade III who had crashed in the Polish province Boldavia with a prototype airplane. (Marvel Fanfare I#16) - Skul watched the Flying Führer terrorizing the Polish province Boldavia. He turned around to Matt Slade III and interrogated him further about the prototype he was flying. 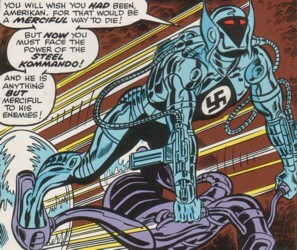 Skul threatened to attack more cities with the Flying Führer when Slade didn't talk to him. Skul's daughter Gretchyn asked her father not to attack innocent children and he smacked her for her sentimentality and ordered to bring Matt back to his cell. (Marvel Fanfare I#16/2) - Upset by the destruction of the Flying Führer General Skul ordered to release Sky-Mines and the Steel Kommando against the approaching Sky-Wolves to stop them from reaching Murder Mountain. (Marvel Fanfare I#17) - After Matt Slade III was freed General Skul stopped his men from intercepting his escape because his daughter Gretchyn was with him like Skul had planned. Some time later Gretchyn informed her father via radio that she had photographed the Flapjack's blueprints. On June 11th General Skul started Murder Mountain's engine and headed with it to the French coast. On his way through Germany and France everything in Skul's way was destroyed. When the Sky-Wolves attacked he ordered to use the Tangler when suddenly hundred Flapjacks were seen. He realized that most of them were just holograms when the Tangler didn't hit. Skul ordered the destruction of the first plane they got a fix on and when it was done he ordered to do the same with the others inside Murder Mountain. The now fearless Skul ordered to destroy the other planes inside the Murder Mountain as well. Skul took a machine gun to destroy the Sky-Wolves himself when his soldiers failed. General Skul faced off with the Sky-Wolves and was killed by them in front of Murder Mountain's engine. (Avengers 1959#1 (fb) - BTS) - Skul survived and fled to Latveria after the war, staying ahead of international law. He eventually joined secret US intelligence organization Icon under the leadership of Geoffrey Sydenham. (Avengers 1959#2 (fb) - BTS) - He took on the alias Dieter Leberkase. (Avengers 1959#1) - Louise Mason was sent to Latveria to investigate Skul's resurgence and his, and other ex-Nazis, connection to a secret society. She began dating him to find out more, but woke him up while browsing through his stuff. He confronted her and she successfully seduced him to distract from her deed. She had already found a skull coin in Skul's possession that proved his connection to the secret society. (Avengers 1959#2 (fb) ) - Dieter caught Louise eavesdropping while he took a private call from Sydenham and assaulted her. Louise jumped through a window into a river to escape and meet with Nick Fury and Eric Koenig. (Avengers 1959#4) - Skul led a team consisting of Count von Blitzkrieg, DoctOrangutan, Fritz Krone, Leopard Woman and Vunderknight to Wakanda to pillage the country and still its advanced technology in the abscence of Prince T'Chaka. Skul ordered Blitzkrieg to use his powers to cause a blackout in Wakanda. Skul then landed with their plane and invaded the country, but the Avengers opposed them. (Avengers 1959#5) - In late autumn 1959 General Skul and his allies fought the Avengers in Latveria. Blonde Phantom knocked Dieter out with a kick to the face. The Avengers left the defeated ex-Nazis behind in Wakanda. 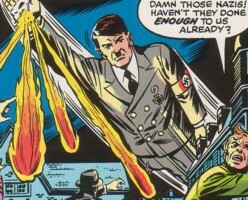 The Flying Führer's likeness was based on Adolf Hitler (as if somebody didn't recognize the haircut and moustache). He received the first name Dieter in Avengers 1959#1. 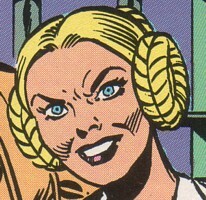 (Marvel Fanfare I#16) - Gretchyn acted worried and told her father not to hurt innocent children when he threatened to attack more cities with the Flying Führer. For her sentimentality she got smacked by her father. Gretchyn told Matt Slade III to be strong when he was brought to his cell. (Marvel Fanfare I#16/2) - Later Gretchyn brought Matt something to eat and told him that she wanted to help him escape. Gretchyn was with Matt when Wolf and Levine crashed into Matt's cell. (Marvel Fanfare I#17) - Gretchyn escaped with Murder Mountain with the Sky-Wolves and flew with them to their secret HQ, the submarine Lobo II. Later that night she found the Flapjack's blueprints and photographed them. Afterwards she contacted General Skul via radio, but Skyler Wolf discovered her doings and caught her. She didn't reveal her father's plan to the Americans and fled after the Sky-Wolves had left Lobo II. On her escape she shot Matt Slade Jr. and stole one of the Flapjacks. She flew to Murder Mountain, but she wasn't able to contact her father and died hit by Murder Mountain's missiles. The Flying Führer was a one hundred-foot long death missile that was adjusted with steel wires to a dirigible. The death missile's hand was arm was moveable. 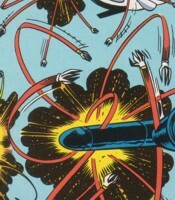 Fireballs (likely missiles or bombs) could be shot from the Flying Führer's palm and fingers. General Skul used it to attack cities and strike fear into the citizens' minds. After several attacks in Boldavia the Flying Führer was destroyed by the Sky-Wolves. They found out about the dirigible, dodged the missile's attacks and destroyed the defenseless dirigible. The Flying Führer fell to Earth and was destroyed. Murder Mountain was General Skul's heavily armed HQ somewhere east of Bremen. It resembled a mountain, but in reality it was a giant vehicle able to drive through the country and destroy anything in its way through his mere size. In its wall many cannons were built in among them the Tangler. Inside Murder Mountain weaponry like missiles and machine guns were stored and countless Nazi soldiers resided in it. 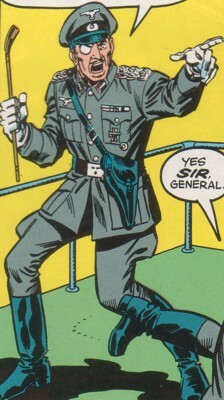 (Marvel Fanfare I#16) - From Murder Mountain's monitoring room General Skul and many soldiers followed the Flying Führer's successful attack on Boldavia. (Marvel Fanfare I#16/2) - From the monitoring room Skul saw the Flying Führer's destruction. Meanwhile Slade was held in a cell until the Sky-Wolves arrived and freed him. 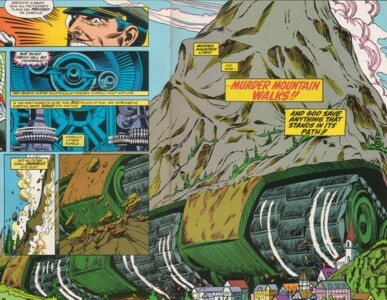 (Marvel Fanfare I#17) - Skul started Murder Mountain's engine and it rolled over villages through Germany and France until it reached the French coast. There it waited for the Sky-Wolves' attack. Murder Mountain's weapons were fired at the Sky-Wolves and Levine's many holograms but nothing hit. The Sky-Wolves shot a whole into Murder Mountain's wall, entered it, destroyed its engine and caused Murder Mountain to explode. These things were mines floating in the air. They exploded when something hit them. Hundreds of them were released into the sky near Murder Mountain by General Skul's order. The Sky-Wolves soon learned the nature of the Sky-Mines and used them to their own advantage. Skyler Wolf caused a chain reaction of explosions after using his rotors to ricochet Sky-Mines into other Sky-Mines. One Sky-Mine killed the Steel Kommando and another one caused Little John to crash after he was first hit by Steel Kommando. He was an armored German soldier who worked for General Skul. His armor enhanced his durability and possessed mini-cannons on each wrist. He used a sky-cycle to fly around in the sky. He was sent out to stop the Sky-Wolves from reaching Murder Mountain. Steel Kommando attacked the Sky-Wolves and hit Little John's rotor with his mini-cannon. After John had crashed Steel Kommando continued to attack the others until Levine's plane "transformed" into a dragon. Steel Kommando fell for the illusion and dodged the dragon's fiery breath. Meanwhile Skyler used his rotors to ricochet Sky-Mines into other Sky-Mines. A chain reaction of explosions then caused one Sky-Mine to fly directly into the Steel Kommando who died in the resulting explosion. The Tangler was one of Murder Mountain's many weapons. It shot metal canisters into the air which bursted open at a prearranged height. The coiled steel cables released from the canisters then entangled the gears of the attacking planes. It was used against the Sky-Wolves, but it only hit holograms created by Sidney Levine and therefore nothing more than thin air.